What's So Hot About Nashville’s Famous Hot Chicken? …the feisty and fiery “Chick” behind our well-known hot chicken! That’s what!! Seattle has coffee, New York has cheese cake, Kansas City has BBQ, Chicago has pizza, and Nashville has hot chicken. So who doesn't enjoy a fun tall-tell of a dramatic lover’s spat that starts with spiteful revenge and ends not only with no harm to the “probably well-deserving” protagonist, but also with an entrepreneurial success story to boot. Nashville is all about entertainment ladies and gentlemen…and so why should the history of our celebrated Nashville Hot Chicken be any exception. Get ready all of you foodies and hot chicken fans alike; we are about to divulge one of Nashville’s greatest folk stories around. Rumor has it, that Nashville’s Hot Chicken begins with a story of two lovers at the height of the Great Depression. Tall, good looking, and debonair there lived a Nashville native named Thornton Prince III. He was well known around the community as being “quite the ladies’ man”. Some might even say, he was a “womanizer”. He was often seen out late on the town enjoying the company of his female acquaintances until all hours of the night. Then on one particular airless sultry summer night, this notorious character, finally headed home to his lady just as the sun was coming up. He had been out all evening indulging in his riotous behavior and now the hot summer sun was beginning to rise with an orange glow and glimmer against the Cumberland River. “Time to head home” the suave gentleman said to himself with a satisfied look. Thornton seemed to prefer his tomcat carousing more than being home. Thornton quietly slid into the house while putting on his most charismatic and charming smile in hopes of easing the irritation of his sweetie. But instead of an infuriated lover, he was met with his favorite breakfast, “fried chicken”! But this time, it looks different. Oh my goodness, was this chicken hot! Hotter than hot itself!! Suddenly Thornton exclaims, “I love it! Is there more?” His lady was befuddled. Her scheme to reform her man and avenge her honor was ruined. Rumor doesn’t disclose what became of the "Feisty Chick” behind the hot chicken, but we do know that Thornton loved that hot chicken breakfast so much, that he worked to perfect its recipe and with his brothers opened the BBQ Chicken Shack. 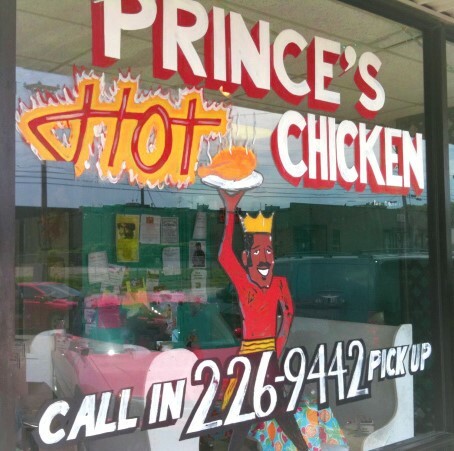 Later the name became Princes Hot Chicken, which is still in vibrant operation today, selling loads of Thornton’s world-famous hot chicken to their daytime and late nighttime patrons. The late-night hours of this hot-eats establishment ironically matches up with the late-night hours that Thornton himself kept when he was out whooping it up on the town. … and who knows, maybe Thornton did become reformed from his revelry ways after all! Traditionally, Nashville Hot Chicken is served as two pieces of fried chicken, coated with a very special hot sauce, on two pieces of white bread, with a pickle. As far as Nashville Hot Chicken goes, there are now more places serving it than you can count. There are Facebook pages, websites, and recipe blogs dedicated to talking about Nashville Hot Chicken. In researching this, I decided to ask some folks what they thought? So I got on Facebook and asked members of the site for their favorite 5 hot chicken stops in Nashville. I received a lot of responses and yet not everyone had the same 5. But here is the list I came up with. 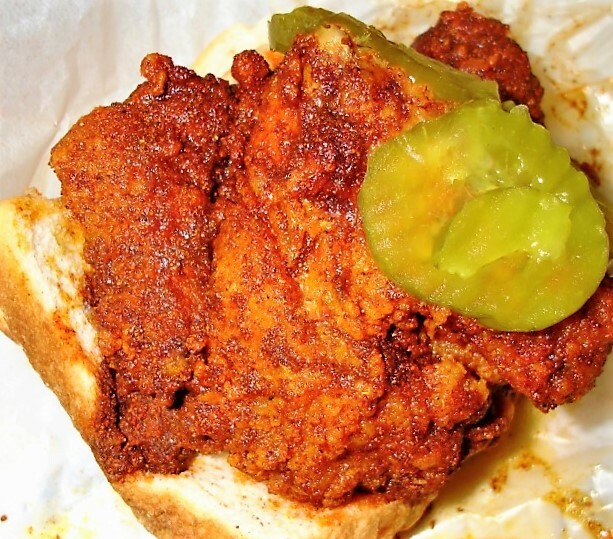 Feel free to add your comments of where you go for your favorite fiery Nashville Hot Chicken.